Occasionally the Lyrita stable confounds one with an unlikely sounding selection. Those versed in its extensive British catalogue will already have seen the release of, say, some Hindemith and swallowed hard. But now we get a real jolt. A disc of Poulenc, maybe, (it’s only twenty-two miles across the Channel) but the second disc in this two CD set unveils a cornucopia of rare things; rare now, let alone rare for 1959 when these tracks were set down. The challenging interpreter is Elizabeth Powell who was born in 1934 in Strasbourg and who is happily still active. She also writes an invigorating note in the booklet, the musical side of which is capably dealt with by Paul Conway. Powell came early to England and studied with Leonie Gombrich – both were refugees. It was from Gombrich that she first encountered Poulenc’s Trois mouvements perpétuels, and at the age of sixteen she was studying in Paris, where she met the composer and played to him. The introduction was effected via Jacques Février, a good friend, so her Poulenc credentials are strong, and the ambience in which she moved at the time powerful. The selection she plays, recorded in 1960, reveals her unsentimental and acutely perceptive sense of directness. She is not quite as dapper as her old friend Février in the Trois mouvements perpétuels but she ensures that rhythmically things are always on the move. She maintains a judicious balance between overt and aloof sentiment in the Suite in C, all the while maintaining elegance and precision. The Barcarolle from Napoli drains away wittily, and she allows the Pastourelle to take wing in a warmly textured way. The second of the Novelettes is also winningly done – with a dash of Gallic insouciance – and responds to the moods, reflections and intimations of the Thème varié – the only post-War piece in this selection – with a vivid sense of characterisation. The second disc delves into more obscure waters. She met all three composers whose music she plays here. Villa-Lobos’s Canto brasileiro is a heady four movement piece written in 1936. She keeps the left hand melody line directional in the opening movement, whilst playing the dappled, sunlight-burnished right hand lines with glinting precision. The sultry sway of the second movement is augmented by melancholia as well as romantic reverie. The toccata drama of the penultimate movement is augmented by ecstatic bell chiming evocations. In the finale the percussive demands are sometimes relentless, but she never takes the easy way out. The Five Pieces from Guia pratico are character studies, written over many years. The plangent Manquinha [No.74 – track 10] is a South American relative of All Through The Night. Much less well known is Frutuoso Vianna whose Corta-jaca, written in 1932, gives Powell carte blanche to exploit its samba-like vitality and virtuosic patina. 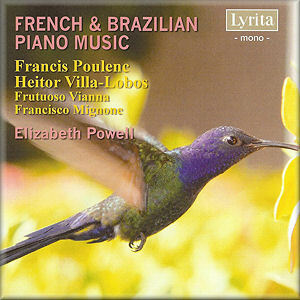 Francisco Mignone’s Dança do Botocudo is engaging and sports a bracing chordal central section whilst his sliver of a Sonatina embraces the communion of popular song and, as with many of the pieces on this disc, abounds in rhythmic licence. The recordings were rather boxily recorded and nothing much is going to change that. This was a fate of many of Lyrita’s pioneering solo and chamber efforts of the time. But what an unusual, unexpected and pleasant restoration this is!